Contest for “Best Vampires” from around the world! Deadline: Entries will be accepted until February, 14, 2016. Here's your chance to appear in “Night Wings”, a theatrical movie going into production in September. Vampires from Romania are flying to New York to attend The Conclave, a gathering for Vampires from around the world. You can either be a modern day goth type vampire, or model yourself after some of the vintage vampires on this site. Dracula would be honored. 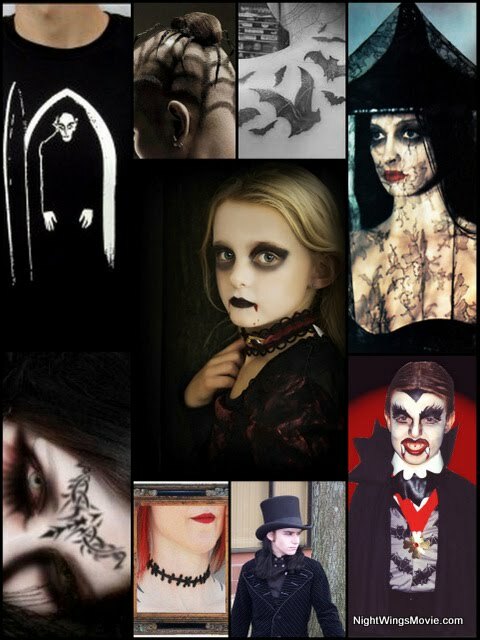 Send us a photo of your “Best Vampire Look,” and we will post it to our site. If you are selected as the winner of the “Best Vampire Look,” you will be invited to perform as one of the vampires in the movie. If you are a musician or songwriter, send us a link to your performance and we will post “Best Vampire Song” on our site. The “Best Vampire Song” will be part of our soundtrack and featured in the film. We also invite sketch artists to create their “Best Vampire Character.” If you are a designer, create your "Best Vampire Jewelry” or “Best Vampire Costume.” The Best Costume and Jewelry will appear in the film. Here’s your chance to be famous. Get your 15 Giga(bytes) of Fame. Don’t be shy. Have Fun. We don’t bite…. Moo wha ha ha!!! If any person appearing in any photograph is under the age of majority in their state/province/territory of residence, the signature of a parent or legal guardian is required on each release. to submit a photo of themself to the “Best Vampire” contest for the upcoming film Night Wings. I have read the Rules & Regulations and understand the premise of this contest and I understand that my child’s photo will be available for anyone who visits the Night Wings movie website to see. I also understand that any personal information given will not be distributed to any third parties and will only be used in the case that my child is chosen as a winner for this contest.